As of this triple-witching Friday, Dec. 21, 2007 we've had 20 closed sales recorded in the MLS in Cocoa Beach and Cape Canaveral since the first. Here are a few that I thought interesting. A classic 3/2, 1950s Florida concrete block home on a wide canal, totally remodeled for $318,000. A crummy rundown home across the street from the beach, $215,000. A 2/2 top floor Cape Winds for $260,000. These units rent for $800 to $1100 per week. The view below. A remodeled, 1244 sq.ft. 3rd floor River Lakes (one of my favorite river complexes) for $250,000. 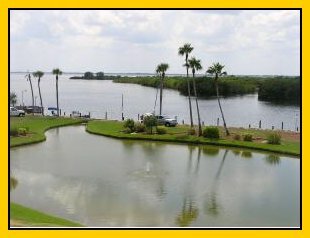 Boat slips, ramp, boat storage and the coolest riverfront pool in town make this complex special. Here's the view across the islands. A 1316 sq.ft. 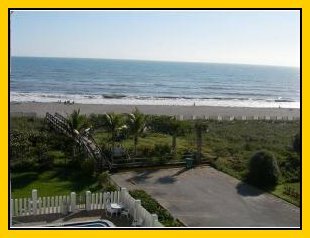 Canaveral Sands side ocean view for $175,000. A furnished 3rd floor, 1286 sq.ft. Sandcastles for $285,000. Rents for $800 to $1200 per week. There were other good ones but these stood out. I'm happy to report that my little office represented the buyers in 4 of these outstanding deals. If you're looking to buy now, do your homework and make sure you understand this market. Not every deal this month has been a good one for the buyer. If you hope to buy low, you better be able to justify your offer. The better your research, the better chance you'll have of convincing the seller of the prudence of accepting your offer. I write a one or two page letter with justifying reasons for my price for every offer I make. An unjustified low offer will get a negative reaction every time. A well written cover letter with comparables, market trends, time costs and other inductive arguments will give a low offer a much better chance of at least being considered and hopefully accepted or countered. This will likely be my last post of 2007. I'm off for a well-deserved rest with family elsewhere. I hope you all have a very happy and safe holiday season. I'll do my traditional year in review post in early January. I expect some of the stats to be shocking. Until then, Sanon.